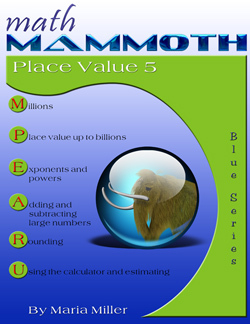 Math Mammoth Place Value 5 is a short worktext that covers place value up to the billions—that is, numbers up to 12 digits—rounding them, and using a calculator. It is suitable for 5th and 6th grades. This book uses the "short scale" commonly used in the USA for naming large numbers; that is, 1,000,000,000 is called one billion (and not a thousand million). 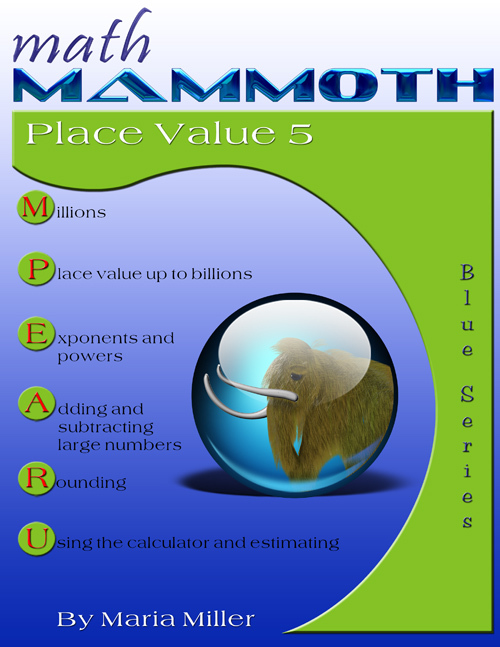 The first lesson covers place value up to millions. Then, we study place value up to billions. Next we study exponents and powers. After working with addition, rounding, and scientific notation, there are two lessons about calculator usage. I have received numerous comments on the harm that indiscriminate calculator usage can cause. If children are allowed to use calculators freely, their minds get lazy, and they will start relying on calculators even for simple things. It is just human nature! As a result, students enter college without even knowing their multiplication tables by heart. Then they have tremendous trouble if they are required to use mental math to solve simple problems. So we educators need to limit calculator usage until the students are older. Children can not decide this for themselves, and definitely not in fifth grade. However, I realize that the calculator is extremely useful, and students do need to learn to use it. In this book, I try to show the students not only how to use a calculator, but also when to use it and when not to use it. This book includes problems where calculator usage is appropriate. We also practice estimating the result before calculating it with a calculator. In the last lesson, students need to choose whether mental math or a calculator is the best tool for the calculation.